If you're new to Charlie's Service Center receive $25 off your first visit on any service or repair totaling $150 or more! Cannot be combined with any other special. Must present special in advance. 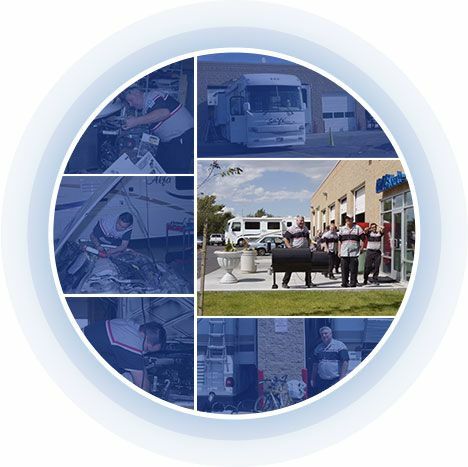 Welcome to Charlie’s Service Center in Sunset, UT, the top choice for honest and affordable automotive and RV repair and service in the area since 1985. Our family owned and operated shop specializes in all makes and models of vehicles, including Domestic, European, Asian, and RVs. Our technicians are ASE certified professionals who can handle any service or repair your vehicle may need, from scheduled maintenance to major repairs. When you bring your vehicle into our friendly Sunset auto repair shop, you’ll receive great customer service and competitive pricing. We stand behind the quality of our repairs with a 24 month or 24,000 mile warranty on automotive work RV work varies. Our shop does it all, including computer diagnostics, custom exhaust bending, emissions testing, RV repair, and so much more. Our shop has a comfortable waiting area with free coffee, wifi, and water. We also offer a free local shuttle service for customers who need a ride while waiting for their vehicle to be ready. If your vehicle is due for a service or repair, don’t hesitate to give our shop a call or stop by today for speedy service! Exercise reasonable care for the customers' property while it is in the shop's possession. RV warranty varies per manufacturer. Ask us for details. "I rolled into town with the rear Differential on my jeep leaking excessively. My friend recommended Charlie's and I was not disappointed. They were quick and charged me $100 less than their quoted estimate. I drove over 1000 miles in the next 2 days, and there was not another drop. I could not be happier with there service"